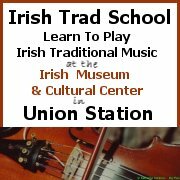 Fans of Celtic music in Kansas City have a great opportunity to pick up some cheap CDs while listening to great folk music, and all of it supporting great folk concerts in the future - including many Irish ones. In addition to a full evening of great Scottish music, TONIGHT, Saturday 9 February, 2008, MVFS are hosting a CD exchange to help underwrite the on-going costs of producing these great concerts. 1. You bring your CDs to the concert (good condition, in jewel cases) and drop them off at the CD table. We say, Thank you! 2. You listen to the first half of a great concert while we sort everything we received. 3. At the intermission, you come back and browse and buy. 6. MVFS has a few dollars to pay for future great performances. This entry was posted on Saturday, February 9th, 2008 at 4:06 pm and is filed under Events, Scotland. You can follow responses via my RSS 2.0 feed. Both comments and pings are currently closed.